Fully encapsulated! 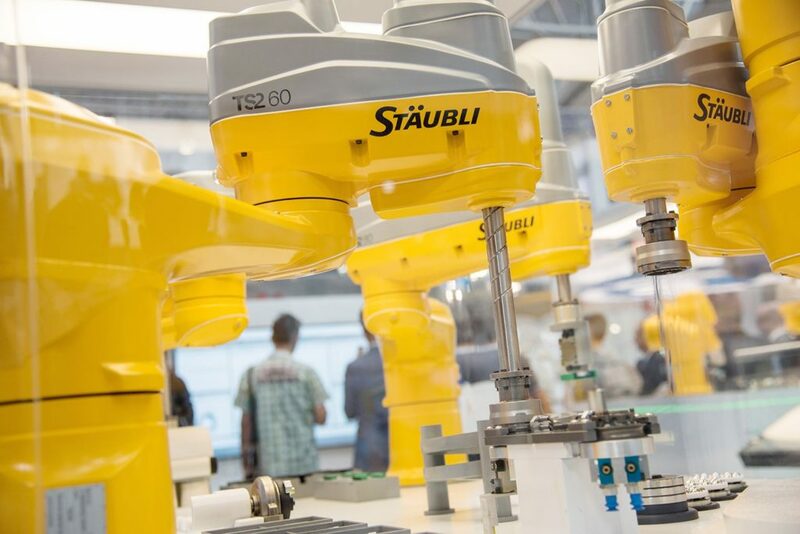 The new TS2 SCARA series from Stäubli Robotics is taking the market by storm with a remarkable enclosed design that marks a complete break with past SCARA models. This technological advance opens up a host of new application possibilities for the TS2. The enclosed structure of the TS2 4-axis series protects it against harsh environments and also facilitates integration into sensitive environments. With no external cabling and a smart design minimizing retention areas, the fully sealed kinematic meets the strictest hygiene requirements while guaranteeing outstanding tool connectivity. The new robots’ compact design also owes a lot to Stäubli’s own JCS-drive technology, which has proven so effective on the company’s 6-axis machines over the past 25 years. This cutting-edge control system specially designed for ultra-short and fast movements is widely appreciated for high-speed assembly and precision handling operations, for example in the automotive industry. Hollow shaft drives allow for a fully encapsulated harness assembly, further increasing the robot’s compatibility with sensitive production environments. To optimize and facilitate mechanical integration, the four models in the TS2 series share a number of components (base, forearm, axes, and reduction gear systems). They also share numerous components with Stäubli’s 6-axis robots, for enhanced cohesion and kinematic performance. The TS2 series and the TX2 6-axis collaborative robots are controlled by the same CS9 controller in order to standardize command integration and wiring between the machine and peripherals and optimize development time. Standardization of spare parts is another big plus for Stäubli robot users. For the first time, models in the TS2 series boast an Ethernet connection (Cat5e) through the arm until arm tip and an optional integrated automatic tool changer. Stäubli will gradually launch a special versions for harsh, wet, and aseptic environments, with NSF H1 oil for food applications, cleanroom and stericlean versions for the semiconductor and life sciences industries, and ESD versions for the electronics sector. The new series will be used in the manufacture of everything from pharmaceuticals, cosmetics and food to medical products, electronics and photovoltaics. Automatica 2018: World premiere presentation of the TS2 4-axis robot on a smart production line. As a taste of what’s to come in the world of connective robotics, these new robots boost assembly and pick-and-place performance and are fully compatible with sensitive environments.